Grow lights have evolved from heavy magnetic, in-efficient ballasts and bulky reflectors to ultra-efficient dimmable and spectrum tunable Light Emitting Diodes (LED) and Ceramic Metal Halide (CMH) all-in-one fixtures. The modern hobby and commercial cultivator now have the power to dial in spectrums specific to the plant strain they are growing. LED’s offer the tunability to go from a vegetative blue spectrum to a flowering red spectrum with a turn of a knob. CMH’s closely mimic the sun, provide the highest gram per watt, and even provide the coveted good UV wavelengths that fend off mold and mildew as well stimulate plant vigor and greater resin and terpene production. Choosing which technology is right for you depends on the size of your grow, how long you will be growing in the space, and your allocated budget. The anticipated duration of your cultivation project is one of the most important factors to consider. Choose LED if you plan on keeping the fixtures for more than 5 years as the high upfront initial cost of LED fixtures will be amortized over a longer period of time. LED bulbs last 50,000 hours compared to 20,000 for CMH. If you are planning for obsolescence and want the greatest yield ROI within 1-2-year time frame, choose CMH. And even if you keep your grow space past 5 years, don’t worry, CMH’s provide a greater gram per watt due to their higher PPF and canopy penetration. Let’s talk about the size of your grow. Because of the lack of overall canopy penetration, you will need to keep your LED lights 12-18” above your canopy. This could be a good thing if your ceiling height is less than 8ft and really need to factor in heat management. If you have a larger and taller space, using CMH technology is a better choice. Increased ceiling height allows for better heat management, better air-flow capability and more even light coverage for fuller and taller flower strains. LED lights put off very little heat and this can be good or bad depending on the size of your grow space and the climate at your facility location. How insulated your space is during winter months is crucial if you are operating in colder climates. Due to the lower heat output of LED’s, heat may need to be added to the grow room in colder months which will increase costs. CMH fixtures put off more heat than LED’s, but less heat than their HPS counterparts. This heat can be utilized to achieve the ideal temperature for your growing methodology, for example, if you are using CO2 injection. The best choice is clear. DimLux for the win. Finally, everyone’s favorite factor to consider, BUDGET! 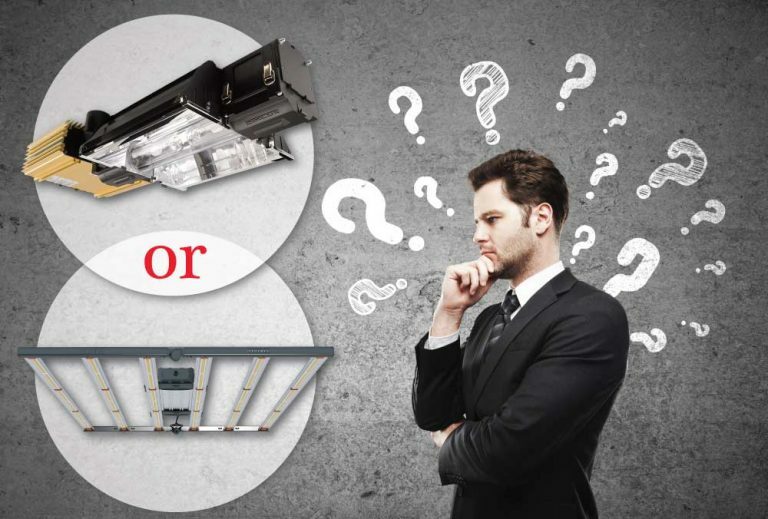 The initial cost of an LED is 2 to 4 times the cost of a comparable CMH fixture. (see Table 1 below) LED fixtures, especially the ones that include the UV spectrum, are very expensive in terms of up-front cost. When it comes to power consumption and the power bill, LED’s only save the grower about 15% on the power bill compared to CMH fixtures. However, the LED grower will use less power for cooling, but that savings depends on other factors in the grow space. The additional cost a CMH grower will realize is replacing bulbs. You will be buying replacement CMH bulbs after 12-18 months of use. In addition, it is recommended that you change between the 4100K CMH bulbs in the vegetative phase to the 3100K CMH bulbs for flowering. Therefore, you will incur the cost of more bulbs utilizing CMH technology, but you will optimize your light cycles and extend the timeframe to replace bulbs. In conclusion, each technology, CMH and LED, are viable to successful grows however they speak to different methodologies and business initiatives.